Fantasy Grounds is the best damn VTT out there. Or at least it is for Pathfinder and D&D 5, 4 and 3.5 and a handful of other games like Savage Worlds, Castles & Crusades, Rolemaster Classic, Call of Cthulhu and a few others. Its a pretty common belief that if there isnt a Fantasy Grounds ruleset available for your game then you cant play it on Fantasy Grounds. Well – the first part is true. And the second. But the third bit is just plain wrong. 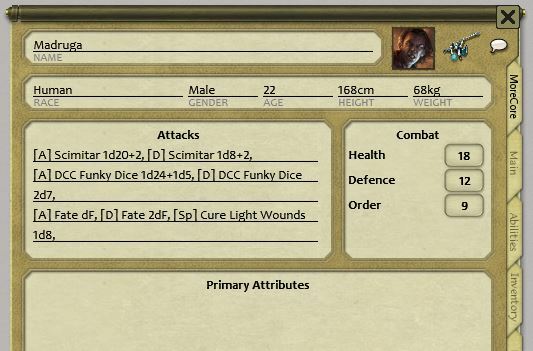 CoreRPG includes an amazing Character Sheet that lets you add almost any Attack, Damage, Skill or other type of roll to your character sheet and organise them all very nicely. They accept direct modifiers and those from the Modifiers box. 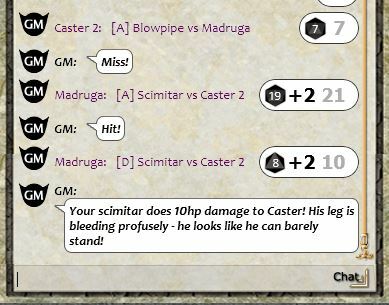 Full descriptions and rolls are displayed in the Chat Window. CoreRPG is a very lightweight extension that adds a few key features to extend CoreRPG for use with whatever RPG system you want to play. See the release notes and graphics below for more information. 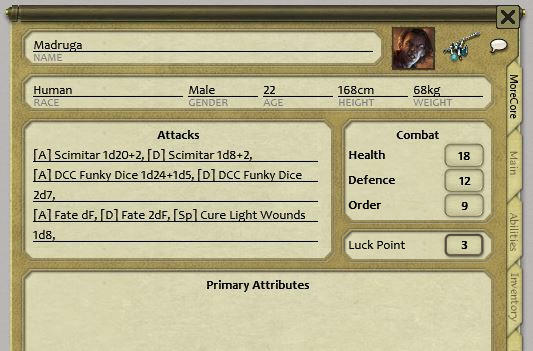 Added User Editable Luck/Hero Points to the Character Sheet. User can rename them to whatever suits that game – Luck Points, Favour, Second Chance, Hero Points etc. When these are double clicked they output a message to the screen and decrement the pool. Once the pool hits zero they can no longer be used. The Icon is replaceable in your theme extensions. 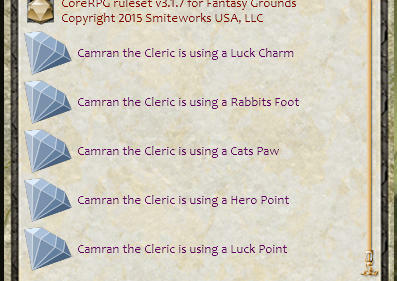 The Dice can be accessed by right clicking the Fate Dice and then click the Custom Dice Icon. ChatWindow reports WHO is being targets and the actual Dice String and Result but does no calculations. This is a generic extension. 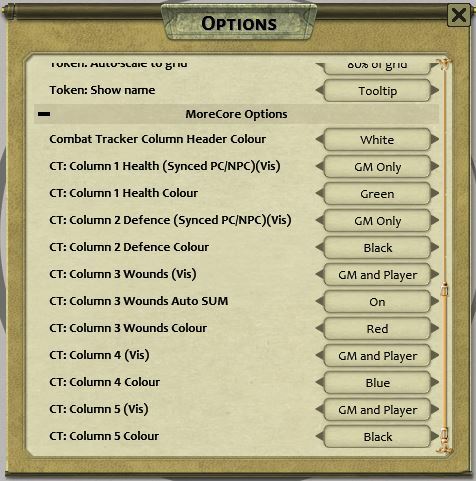 The Character Sheet has an Extra Tab – Health, Defence and Order are linked to the Combat Tracker. Attach and Damage strings are rollable and will report to Chat Window. 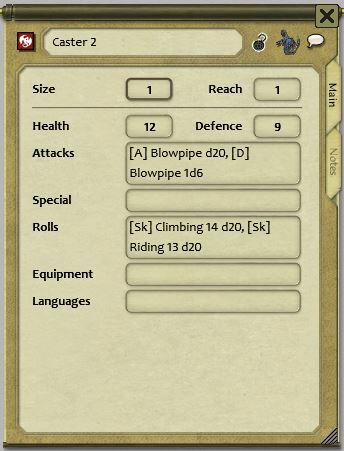 NPC Sheet has rollable Attacks/Damage and another field for Skills or Feats or Spells. Health and Defence are also linked to Combat Tracker. 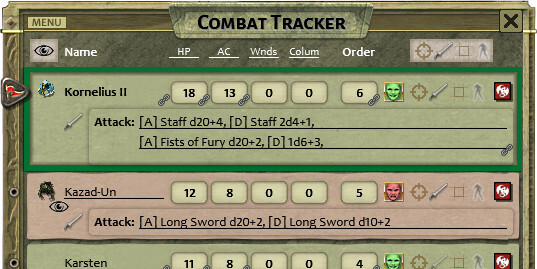 The Combat Tracker has up to 5 additional Columns – 2 of which are linked to the CharSheet as is Order. NPC attack strings are rollable from here and are added automatically from NPC sheet. 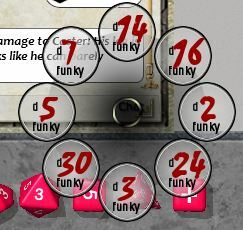 Download this file and place in your Campaign folder to give you HotKey access to the Funky Dice. 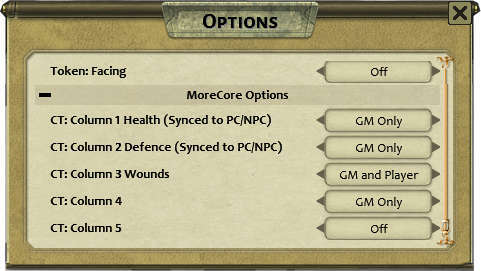 New Options in the Options Campaign Tool. You can turn each of 5 new Columns On for the GM, On for the GM and Player or Off for everyone. You need to restart the session after making this change. Column 1 is linked to a new Health Field on the Character and NPC sheets. For Characters it stays linked and will reflect any changes. Column 2 is linked to a new Defence Field on the Character and NPC sheets. For Characters it stays linked and will reflect any changes. Columns 3-5 are not linked and can be used for anything you require. Order is now linked to a new Order field on the Character sheets. Column headings are editable by the GM. 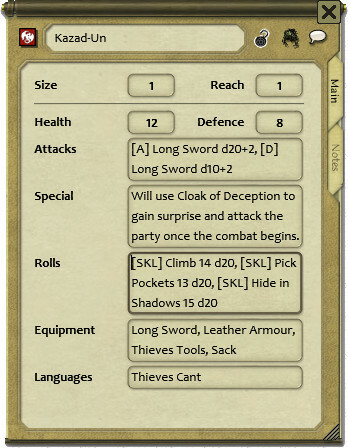 Attacks have been added to Characters and NPCs and are linked to the respective sheets. These attacks may be rolled directly off the Combat Tracker by the GM. Health – linked to the Combat Tracker. This might be Hit Points, HP, Vigor or any other similar term in your RPG system. Defence – linked to the Combat Tracker. This might be AC, Armour, or any other similar term in your RPG system. Order- linked to the Combat Tracker. This might be Init, Initiative, or any other similar term in your RPG system. I have added as much commenting to this as possible in the hopes that it may be a decent reference for others who want to do some extensions for Fantasy Grounds.